At least that’s what card companies, chocolate factories, and flower shops would have us believe around this time of year. Of all things to believe in, love is certainly a noble and worthy cause. As someone who has never been married and spent my fair share of Valentine’s Days celebrating the unconditional love of my dogs, I could give you a million reasons why romantic love is overrated. Because as cliche as it sounds, love makes the world go around. The problem is not with love. 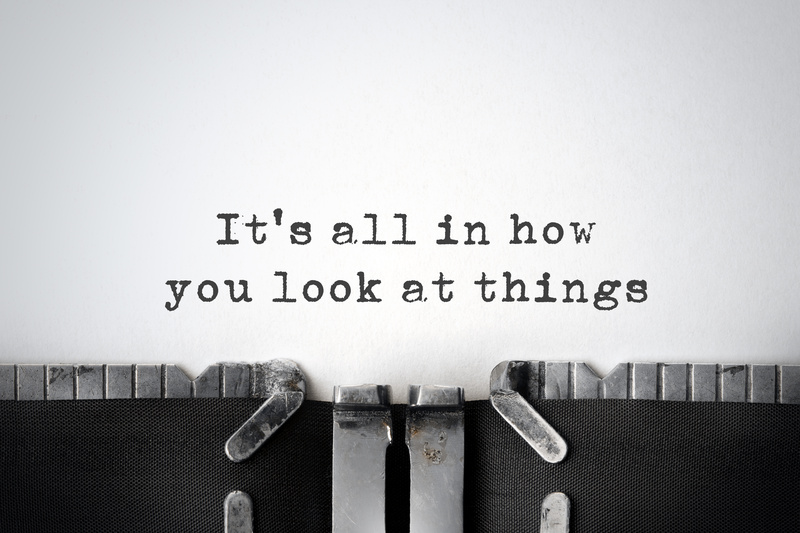 It’s with our limited view of what it should look like, feel like, or how and when it should show up in our lives. If you are like me and Hozier, “I fall in love just a little, oh a little bit, every day with someone new.” Or something. Don’t get me wrong. I love the one I am with. Because of that, my cup runneth over with love.. So I am looking to fall in love just a little bit every day with someone new because there are so many people in need of love. No one may have noticed the tiny tears in a person’s heart. No one may have noticed the way a person is lovable, adorable, vulnerable, creative, generous, surprising, kind, or appears to be broken. When I do, I let my love open the door. Whether that be through a smile, a reassuring word, a gentle touch, or just keeping my mouth shut when I might be tempted to criticize or judge. Often times these things can mean more than diamonds, flowers, candy, or over-the-top declarations of love. And I don’t limit myself to people. I especially love trees and have no shame in wrapping my arms around their trunks whenever I have the chance. And, oh, I do love my animals. I love art and music and poetry and delicious food. I love my snow pants because they allow me to be warm and comfy in winter weather. And they create a softer landing when I fall off my skis. I love creating something out of nothing and transforming the ordinary into the extraordinary. None of that can happen without love. So I will continue to be a hopeful romantic and believe in love and all the ways it dares to shows up in the world against all odds. And I will send a whole heart full of love to you. P.S. I would love to know what you love and what songs about love you love. 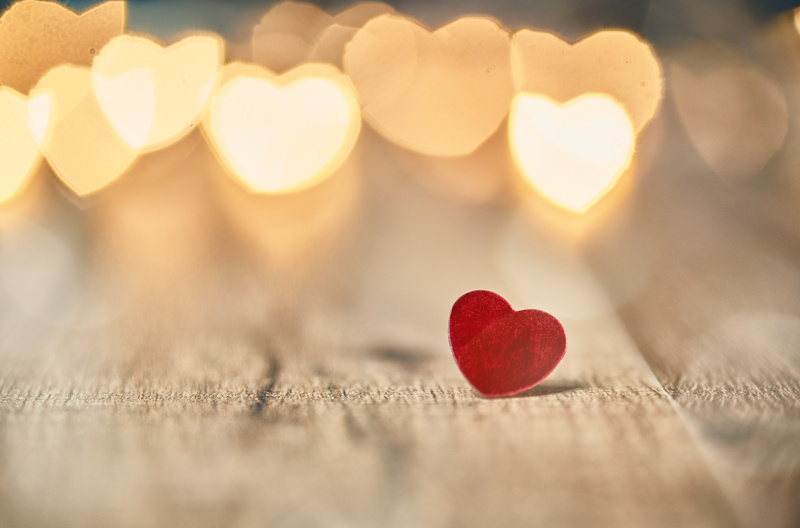 Please add your playlist of love songs in the comments below. 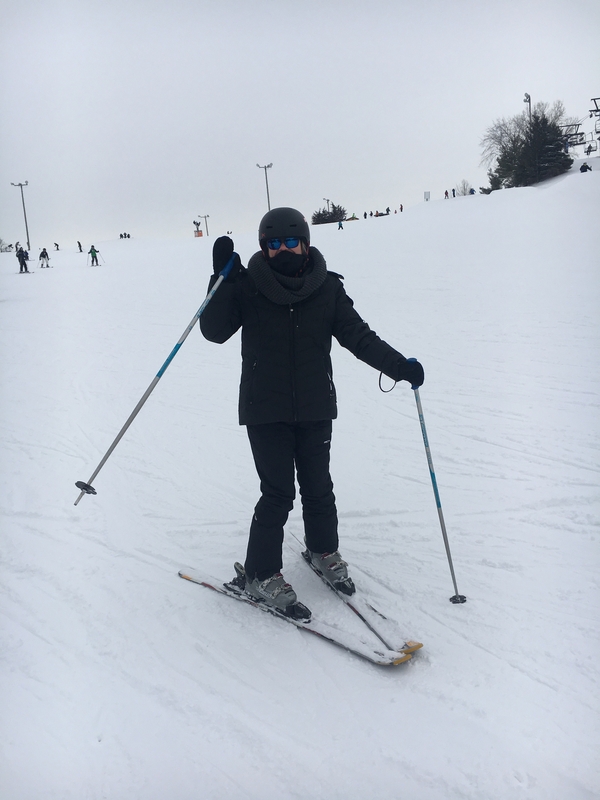 Since the snow continues to accumulate here in Iowa I thought I would try my luck at skiing on Saturday. 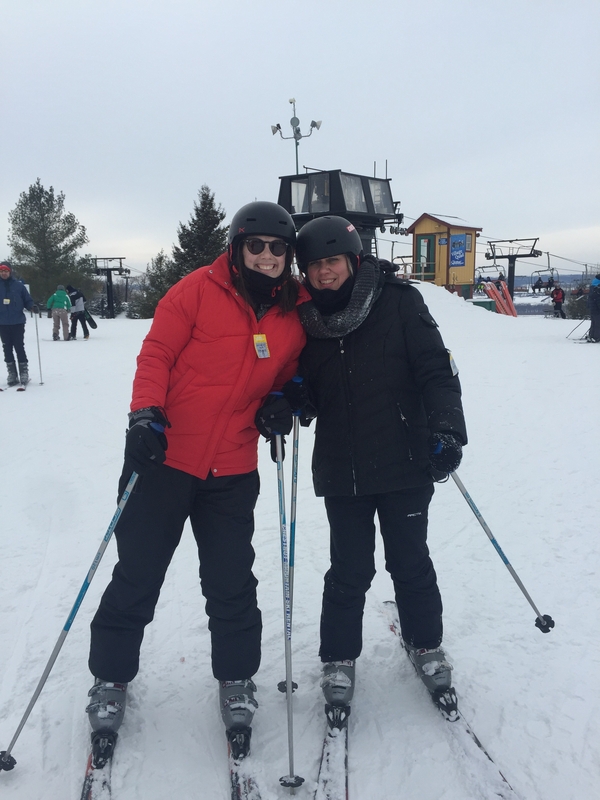 My niece wanted to ski and Bob’s nephew wanted to snowboard and because they still think of me as the hip and crazy aunt who will try anything, I could not disappoint them. I’m not really sure why I thought I could ski since I haven’t been on skis in over 20 years and I’ve never once had a lesson. Maybe it’s the subliminal messages the Winter Olympics athletes are sending us to get out and act like an Olympian in our own lives. By attempting to ski I learned about myself, fear, fun, and falling down. As much as I like to think I’m able to listen to my body’s wisdom, my head hijacks whatever is attempting to communicate through my extremities at the first sign of danger. In my case, this happened as soon as I slid by boots into the skis and attempted to maneuver over to the bunny hill. The ability to put one foot in front of the other without falling over suddenly became a monumental task. “What was I thinking?” became the only thing I was thinking. Until I fell and then, “I’ve fallen and I can’t get up!” became the predominant thought. “Take off your skis!” Kat advised as I pondered how my knees and feet might work in unison with skis pointed in opposite directions. “You can do it!” Brad encouraged. After a successful run down “Rookie’s Ridge“, I moved on to the “green” hill where I wiped out a couple of times and skied right into a snowbank. I think it takes most people 3-5 minutes to ski that slope. I’m pretty sure it took me 35. “Come on, Pen! Try going a little faster,” the young ones quipped. It sure seemed like I was moving at top speed when I skied into the snow bank. Luckily Kat and Brad were more patient than I ever expected them to be. They even acted like they knew me when I came careening into the chairlift area. Did I have a fabulous time? A humbling time would be more like it. In my mind, I still believe I’m their age. It always shocks me when my body reminds me this is no longer the case. But courage begets courage. I’m not sure I would have even agreed to try this had I not just started a mastermind group called Practicing Everyday Alchemy and been buoyed by the support and faith of a fearless group of amazing alchemists. Every Olympian has an entire team behind them encouraging, supporting, training, and seeing them through their toughest and most glorious moments. Why wouldn’t I put a similar support system in place when I take my leap into the unknown? Having just read an incredibly insightful book by Shawn Achor called Big Potential, I wouldn’t attempt anything worthwhile without assembling a star system that allows me to not only to tap into my potential, but the bigger potential of everyone in the group. It’s often the tiniest of actions that catapult us out of our comfort zone and into what I call our evolutionary zone. Sometimes it’s heading to the slopes. Other times it’s passing on dessert or an alcoholic beverage. It could even be cleaning out a room in order to create some breathing space. What courageous acts – big or small – have you taken lately? Who makes up your star support system and allows you to shine your light in new and adventurous ways? Please share in the comments below so we can celebrate your moments of magnificence with you and those who made it possible for you! As any of you who have been around small children know, kids are curious. Their favorite question is “why?” Whatever answer you provide inevitably leads to another question. They beg for you to “tell me more” regardless of how ready, willing, and able you are to dig deep into the subject of their inquiry. Over time their questions may wear you down and you may tend to treat all questions as irritants rather than clues that unlock the great mysteries in life. Questions like, “How much?” ,”By when?”, “Where in the world?”, and “What the heck?” often hint at answers that may be just as tiresome as the questions. Just keep it simple and start with why. 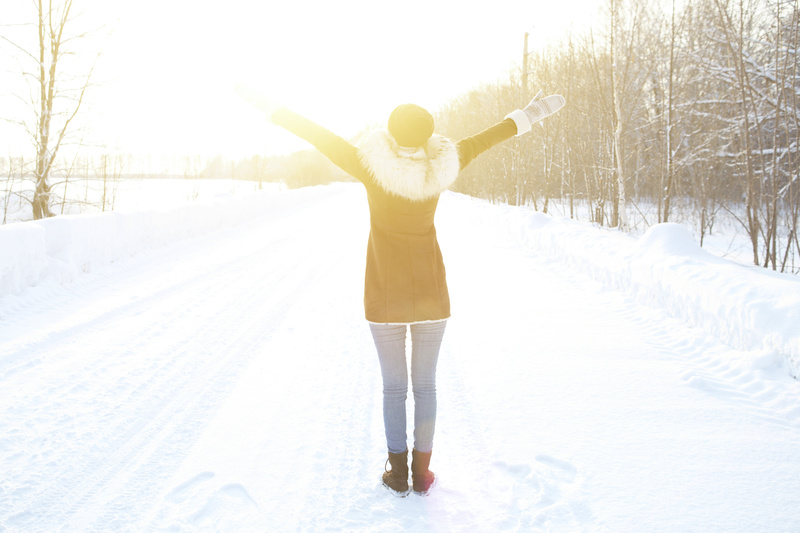 If you are making New Year’s Resolutions this year, why do you want your life to be different? I’m sure you have a compelling answer. I’m also sure it’s not the first one you will come up with. If you stay as persistent as a child and let one answer lead to another question, then you might discover why it really matters. And then you are on to something. The reason most resolutions fail is not because you don’t have the discipline, willpower, wisdom, strategy, or support to achieve them. The real reason resolutions fail is because you don’t have a clear and compelling reason to work through the challenges that will present themselves as part of your journey. What you’re resolving to do is difficult. It’s the reason you haven’t achieved or been able to sustain your success before. So what’s different this time? If nothing has changed and you’re not willing to do anything different, then don’t waste your time making the resolution. It just leaves you feeling bad about yourself. But if you are willing to do something different, whether that be to hire a coach, take a class, or join a support group, then write your goal down and take at least ten minutes to imagine what it would feel like to achieve it. Then grab a pen and paper and write this down at the top of the page: THIS TIME IS DIFFERENT & I WILL DEFINITELY SUCCEED BECAUSE. And then list at least 10 reasons it is different and why you will most definitely succeed. I recently did this and came up with 25 reasons I will be able to create a thriving business doing what I love, with people in love, in places I love. And let me tell you, it was one of the most empowering things I’ve done. I got the idea from Mike Dooley’s book, Playing the Matrix, where he talks about creating results based on how you want to feel instead of focusing on what he calls the “cursed hows” and attaching to the results of getting what you think you want. 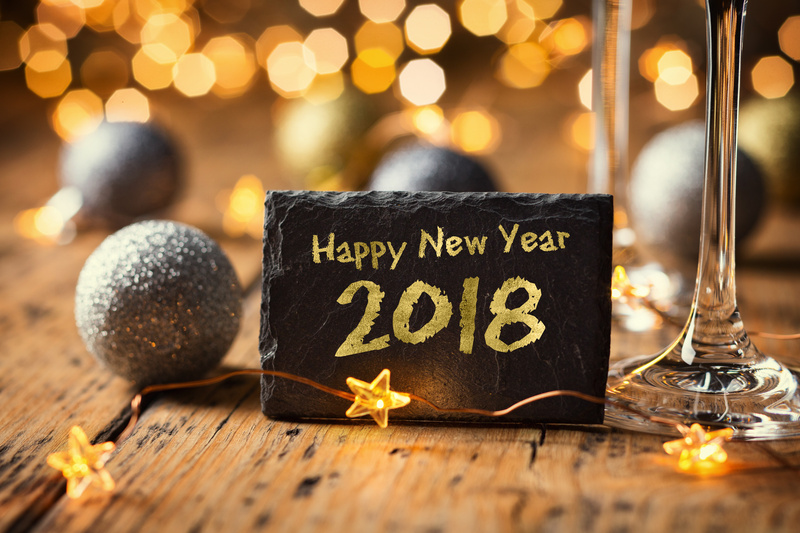 If you are resolving to be a better version of yourself in 2018, give yourself a boost by writing down the reasons you will succeed. This is something you can look back on any time you are tempted to give up. #1 – I’ve prepared for it and have a strategy. I’ve invested an incredible amount of time, money, and resources to make this happen. I’ve taken lots of baby steps, tested the market, and had consistent, small successes and epic failures. #2 – It has become my #1 priority. I have given up many things so I can spend time building my business. I invest any extra time I have and money I make back into my training so I can work with great coaches, be a part of a supportive community, and continue mastering new technologies. I follow my fascination and never stop learning. #3 – I get by with a little help from my friends. I have been actively building my community for several years. I now have an amazing tribe of peers, mentors, and clients who do great work and are willing to collaborate, support, participate, and play along. #4 – I’m not attached to the specifics of how it needs to happen. I step into the flow of my life and focus on feeling good, staying healthy, being creative, trying new things, doing things that make me feel alive and energized. Of course, I’d love for this to yield certain results, but I’m not so focused on those results that I limit myself or miss even better opportunities. I celebrate the smallest successes as I keep the big picture in mind. #5 – I show up. Every single day I take one small step in the direction of my dream. I stopped hiding. I shed my invisibility cloak so I can do the things that scare me (like make a lot of videos), and keep putting myself out there in fun and creative ways. #6 – I live in a loving and abundant universe. I am connected to source energy. The only lack is a lack of imagination. My life supports me, my tribe has my back, and the universe conspires on my behalf. I’m grateful to get to do this work. #7 – I own my throne. I stand in my power and attract fabulous clients, co-creators, friends, mentors, opportunities. I’m done apologizing. I want what I want. This is who I am. These are my gifts. This is what I charge. This is how I work. This is the time I have available. #8 – There is enough for everyone. My success inspires others. My fearlessness, my failures, and my willingness to take action encourage others. We’re all in this together. #9 – I fire on all cylinders – or all 7 chakras, as I prefer to say. I am grounded in my body as well as open to spiritual assistance and worldly wisdom. I love to think and create and spend my time with heady stuff. That makes it tempting to ignore my body. I’ve learned to embody and bring my ideas into my body and get grounded. When I eat healthy foods, get outside in the sunshine and play with the dogs, and get some body work when I need it, everything goes much smoother. #10 – I honor my lineage. I stand on the shoulders of giants. I value the teachers, mentors, coaches, shamans, spiritual teachers, and students I’ve had the good fortune to work with. I honor them by continuing their work in my unique way and value all of us by charging enough that I can support my business and continue to share the message. Here’s to you being wildly successful in 2018. I’d love to see your list and learn about your dreams for the New Year. Please leave your comments below. For someone who is not real big on the holidays, I absolutely adore these days between Christmas and New Year’s Day. Part of it is because I work full-time at a college and, like our students, we get these glorious days off before starting full steam ahead again in January. The other part is I happen to believe there is something magical about these days. Because they are the last days not just of the month or the quarter but the whole year, people tend to write them off as an insignificant segue into start of a New Year. It’s as if these days have a secret they will share only with those who can get quiet enough to listen and be still enough to notice. While many people are bustling about returning items, reconnecting with family and friends, or trying to check off the last few items on their yearly to do list, I’ve been quietly calling the pieces of myself back home in order to acknowledge all the adventures I’ve had during this trip around the sun. Before I even begin thinking about what I want to create in the New Year I ask myself a series of questions about the current year. The answers I get inform my direction and my intentions for the upcoming year. I wanted to share them with you as a way to consider what 2017 has meant to you. You may want to sit with them, answer the ones that feel most in need of answering, skip those that don’t make sense for you, or make up your own. After allowing my answers to these questions to reveal themselves to me, I take out a piece of paper and put a big plus sign on one half of the page and a big minus sign on the other. Armed with the insights from this year, I can clearly articulate what I want more of and less of in the New Year. Because this is a process and the questions require time to marinate, I first read through them and let them seep into my psyche before attempting to answer them. Then I grab a pen and let the answers come to me. By about Sunday I’ll be able to collect my responses and apply the perspective they afford to the New Year. On Monday I’ll spend some time welcoming 2018 and contemplating the choices ahead of me. I’ll Name & Claim what I intend to create and then release that intention into the wild. I share this with you in hopes that these questions might help you find some clarity and direction in the New Year. Maybe you can ask some of these questions of your family and friends at a New Year’s Eve gathering? May you savor these last days of 2017 as they share their secrets with you. Where did the smallest step produce the biggest result? What was the best advice you were given this year? Who shared it with you or how did it find its way to you? How aware of your body were you throughout the year? Did you feel connected to your body and allow yourself to feel the pleasure of being in a body or did you disconnect and spend the majority of time in your head? Did you have any health challenges or achieve any health or fitness goals? What books, movies, music, conversations, trips, trainings, or classes forever changed the way you think, feel, see, or experience life? What places provided you with the most peace or inspiration, the best working environment, the most creative conversations, the most nutritious and delicious food and drinks, incredibly beauty, or fascinating people? Where did you love hanging out and with whom? What was the scariest thing you did this year? How did you feel once you faced your fear? What was the most thrilling thing you did, said, felt, or experienced this year? What made you feel most alive? What caused you the most pain or regret? What new technology did you master that catapulted your business or personal life forward? What products, apps, or life hacks made your life easier, more organized, or more fun? What purchased created the most joy and/or frustration as you worked through the learning curve? When did you need to activate your superpowers and how did you do so? Was there a particularly painful lesson that held an exquisite gift for you? When did you have to practice patience and learn to move at the pace of grace? What creative, meditative, fitness, or health practices did you begin that made a noticeable difference in the quality of your life? What new foods or drinks did you discover this year that you now can’t live without? What health care practitioners offered you the most comfort or provided you with the most helpful information necessary to achieve your optimal health and well-being? Were there any departures in your household or family circle? Did you move or add on to your existing home or somehow alter your living arrangements? Did you start a new adventure, begin a new business, retire, or leave an old career to start something new this year? Who was on your dream team? What collaborations or partnerships gave you the most joy and brought about unexpected or innovative results? Who needed to be fired from your life? What relationships created chaos, unnecessary drama, miscommunications, or major meltdowns? Where did you create something amazing out of nothing? Where did you take “massive imperfect action” as my coach likes to call it? What crazy idea captured your attention and refused to let go until you took action? What happened next? Where did you lose track of time and fall into the flow of doing what you love? How did money show up in your life this year? Did you experience any money miracles or windfalls? When did you feel especially abundant? What thoughts, practices, purchases, or actions contributed to that? When did you feel constricted or tight about money? What thoughts, practices, purchases, or actions contributed to that? Did you read any books, attend any seminars, work with any financial wizards or coaches who helped shift your mindset around money? Who walked into your life this year? How did their presence impact what’s possible for you? Who walked out of your life this year? How did their absence create more presence for you? Who do you long for? Who is missing in your world? What relationships shifted or transitioned as you changed and grew? Where was your love most needed and how easy was it for you to offer it up? Who surprised you with their unwavering support and love? Who disappointed you? Where did you go this year and how did you get there? Did you travel for business, for pleasure, out of obligation, and/or because it was your soul’s calling? Who did you meet in your travels? How did God/the Universe/the Great Creator/Divine Feminine or Masculine reveal itself to you? How did you respond? Were any of the answers you were seeking hiding in plain sight? What was lost? What was found? When did you feel closest to God or Source energy? What was surprised you most this year? How did this surprise rearrange your reality? What unlikely sources of support, funding, friendship, or freedom showed up for you? How did world events impact your actions? Did these events alter your opinion of humanity or change the way you view the world or the future of the planet? Did these events catalyze you to join a movement, stage a protest, offer aid or assistance to those in need? * Mine would be: You can’t make this stuff up. Really, it was that kind of year! Totally amazing. Top 10 Takeaways from the year? List them here! I’d love for you to share any aha’s or epiphanies that may arise from these questions in the comments below. Whatever You Think You Can Do, Begin It! Our Tapping Into Your Wellpower Retreat is just 9 days away! I’m so excited to be spending a day at the Rickert Lodge in Bellevue with such fabulous new friends. It takes courage to commit to spending a day doing a deep dive into those areas where most people are content to stay where it’s numbingly comfortable. Up until now, I’ve attended retreats. Lots of them. This time I’ll be leading one. It’s a gigantic leap but one I’ve been preparing for all summer. I’m thrilled to put my spin on the lessons I’ve learned from hanging out with some of the best teachers in some the world’s most beautiful places. I have grand plans to host future retreats in the places dearest to my heart like Santa Fe, St. George, and Monterey. But for my first go round, it makes sense to stay local and start small. I’ll get through 1 day and work my way up to a week. I couldn’t ask for a lovelier setting than the Rickert Lodge in Bellevue, Iowa. It’s close to home but far enough away from my normal work environment that it feels like a get-away. The biggest challenge has been to pick just one theme for the day. I remind myself it has taken me a lifetime to integrate the various teachings and experiences I’ve had. As tempted as I may be to throw a little bit of a lot of things into the ring, the last thing I want to do is overwhelm someone coming to me in search of tranquility. So I will teach something I love (tapping/EFT) that I know can make a profound difference in the lives of others in a very short time. This is the beauty of stepping into your well of power and owning your throne. It forces you to be a better version of yourself. Putting together this retreat has proven the Goethe quote to be true. All kinds of things came into alignment as soon as I committed to hold the retreat. I have become more of a business person than I ever thought possible for a creatively quirky individual. Incredibly, I now have a YouTube channel, an active Instagram account, and have done several FB Live segments. Upleveling is oddly disorienting until you realize this is what you were born to do. Then you understand that there really are no mistakes, just learning opportunities, and no matter how steep the learning curve, what’s on the other side is usually worth it. Doing the necessary hard work is really the only way to appreciate the magnitude of what you are able to manifest. There is still time for you to join me at the retreat. 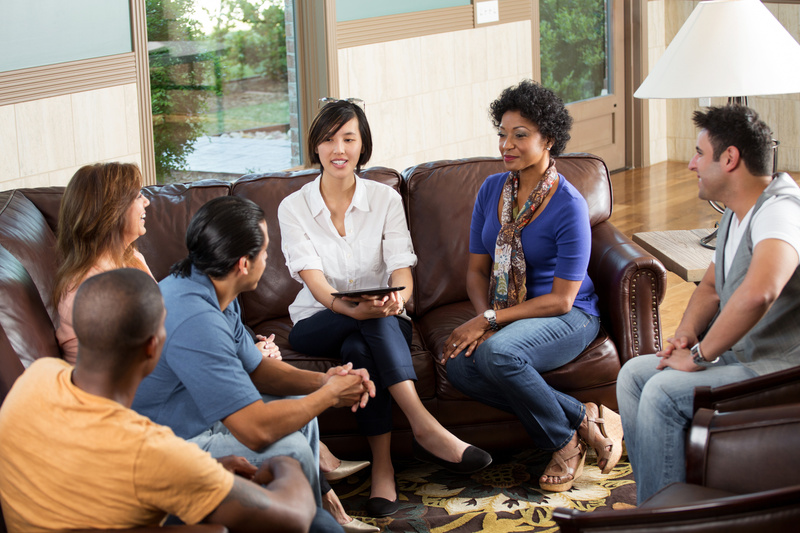 We have the perfect size group for this kind of transformational work (20 people), but there is always room for you if this speaks to your heart. Contact me if you are interested in attending or would like to host an event of your own and need a little nudge to make it happen. Click on the Retreat tab above for all the details. The topic of this week’s Sunday Summer Stretch Series is chaos. Specifically, how to keep calm in the midst of uncertainty, anxiety, and fear. I’m fairly certain if you’re alive on Planet Earth, you’re feeling the effects of the intense energy vying for your attention. Everywhere you look, you can find evidence of escalating emotions as it appears we have collectively taken the fun out of “dysfunctional” and now just frighten the life out each other. But if you look closer and get quieter, I believe you’ll find evidence that we are equally committed to collaboration, communication, and contemplation. Admittedly it takes practice to cultivate consciousness in the midst of collective chaos. It’s difficult to decipher the facts and figure out what’s really going on. It takes courage to stand up for what’s true and what’s right for you. And it’s almost impossible to interrupt the pattern you’ve been programmed to run when you get scared or feel threatened. But it’s imperative that you are able to question, object, or offer another perspective than the one that leads down the rabbit hole of doom, doubt, and drama. With all that’s already on your plate, I’m going to assume you are not looking for yet another cause to commit your evenings and weekends to. So I’m going to suggest a simple practice that you can do anywhere, anytime you feel stressed. It’s a simple tapping exercise that I originally learned from Gabrielle Bernstein that goes like this. And finally touch your thumb and your pinky finger and say the word “me”. You can substitute the word for whatever quality you wish to experience in place of “peace”. It’s easy to do. It’s so subtle no one even has to know what you are doing. And it’s a tactile reminder for you to call in the quality that you most need in the moment. Because sometimes all you need is a moment to restore your equilibrium. I like to say you are only one thought away from a new perspective. It’s just getting to that thought can take a little wrangling. For more conversation around this topic, jump in on our FB Live Sunday Summer Stretch Series episode this evening at 7pm Central time. We’d love to hear how you keep calm and carry on. Leave your feedback or suggestions in the comments below. The topic of today’s Sunday Summer Stretch Series is perspective. Hopefully the Get Stuff Done & Have Fun 21 Day Challenge has prompted you to view what’s fun for you to do as something that’s also essential for you to do. The 5-10 minutes it took to do something creative, thoughtful, or fun as part of your daily challenge most likely colored your whole day with a dollap of delight that just a few days ago you may have determined you didn’t have time for. Think of all the joy you would have missed just last week alone! By now you could be seven days into the challenge. Even if you are only a day or two into it, how has challenging yourself changed your perspective? What is possible for you now that you didn’t think was possible last week? Here’s what I learned is possible for me. I am smart enough to deal with IT issues by calling the help desk and patient enough to stay on the phone as long as it takes to resolve the issue. While this is anything but fun for me, it does give my inner geek a thrill to reconfigure my whole internet setup so that it runs faster and with less downtime. And there is a badge of honor that comes with surviving the on-hold hell of being transferred and re-routed and explaining your situation succinctly to each new agent. Ironically, every time I uplevel my business or upgrade my skills, it’s as difficult as the first time. Sometimes, even more so because I assume I know what I’m getting into and the learning curve will be easier. But not having been at this level or having dealt with the difficulties that come with playing in a bigger arena, I can’t know what I don’t know until I’m faced with not knowing. That’s where beginner’s mind is most helpful. Since I got my first MacBook Pro in May, the Apple Care people have become my new BFFS. Yesterday is was the WordPress Happiness Engineers. Today it was my foreign friends at Netgear who spent the morning teaching me about modems and routers and secret reset button that you press with a paper clip after entering a special code. (Not disclosed in the instructions.) Tomorrow I suspect the people at Mail Chimp will be welcomed into the fold. And what a curious fold it is! “It takes a village” is all I can say. To build a dream, create a life, find a tribe, or manifest a vision. It takes a pit crew. The kindness of strangers. A treasure map. Some perspective. And a few good dogs snoring and farting freely at your feet. Let me know in the comments below what you are dreaming up and how I might support you. For others, it sends you into immediate overwhelm. The mere thought of one more thing challenging you might send you over the edge. But what if I presented you with a challenge that encouraged you to get stuff done and have fun? The past couple of years I’ve hosted a Get Stuff Done 1×31 Challenge during the month of July. This summer I’ve been so busy creating the Sunday Summer Stretch Series that I haven’t had the bandwidth (literally – don’t even get me started on the saga with Century Link) to simultaneously launch another challenge. But since today’s topic for the Sunday Summer Stretch Series is challenge, I thought I’d stretch myself to try a slightly different version of the Get Stuff Done 1×31 Challenge for August. I’m calling this one Get Stuff Done & Have Fun. Yes, we want to get stuff done. But sometimes the stuff we get done is just not fun. We save the fun stuff for that elusive someday when we have time to indulge ourselves in a little self-care. In other words, the 12th of Never. So to put an end to that, I’m proposing a 21 Day Get Stuff Done & Have Fun Challenge. Because I know some of you rebels will need some wiggle room to stick to it, these can be 21 consecutive days or 21 random days. But all 21 days need to be in August of 2017. The stuff you get done has to be something you have been wanting to do. If you don’t want to do it, challenge or no challenge, you probably won’t do it. The stuff you do for 21 days has to be fun for you. What’s fun for someone else may not be fun for you, so do what’s fun for you. The stuff you decide to do should be doable in 5-10 minutes. You are welcome to spend more time if your creativity kicks in and you’re on fire with desire to continue, but start small and simple. You have to participate for 21 days in August 2017 to qualify for the goodies. You pick the days – just make sure you participate for 21 of them. 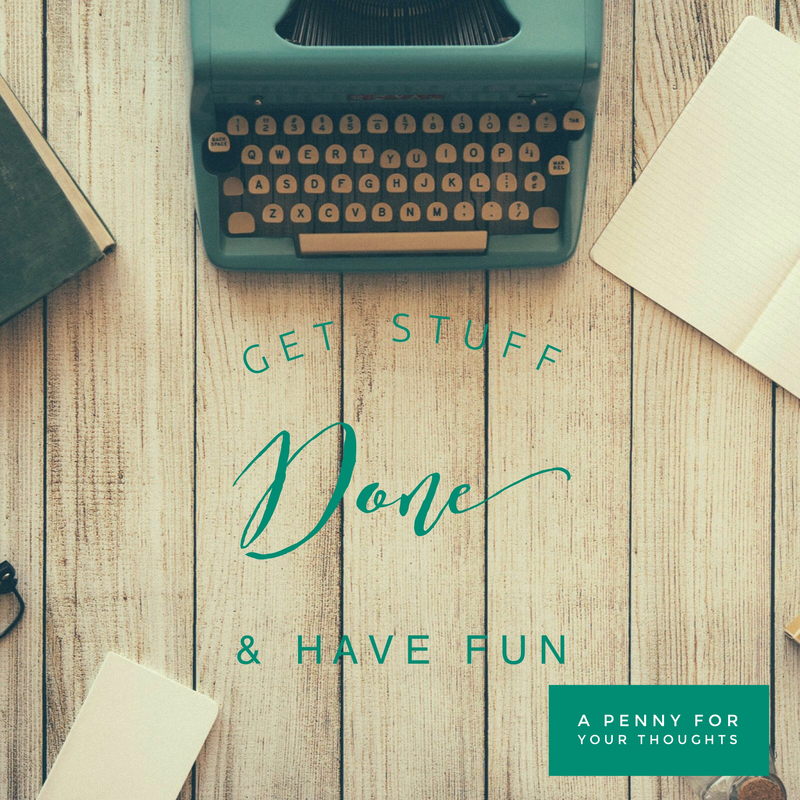 You have to post the finished project either in the comments below, in the Facebook Group – Get Stuff Done & Have Fun, on Instagram at #getstuffdonehavefun, on Pinterest or email me on the day you do it. How else would I know what you’re up to? And what do you get for all this effort? Prizes, of course, sprinkled throughout the challenge. The grand prize is …. a free registration to the Tapping Into Your Wellpower Retreat in Bellevue, Iowa on September 23, 2017. Yep, you heard that right. That’s a $200 value! And it can be yours just for having a little fun doing what you want to do anyway. How great is that? 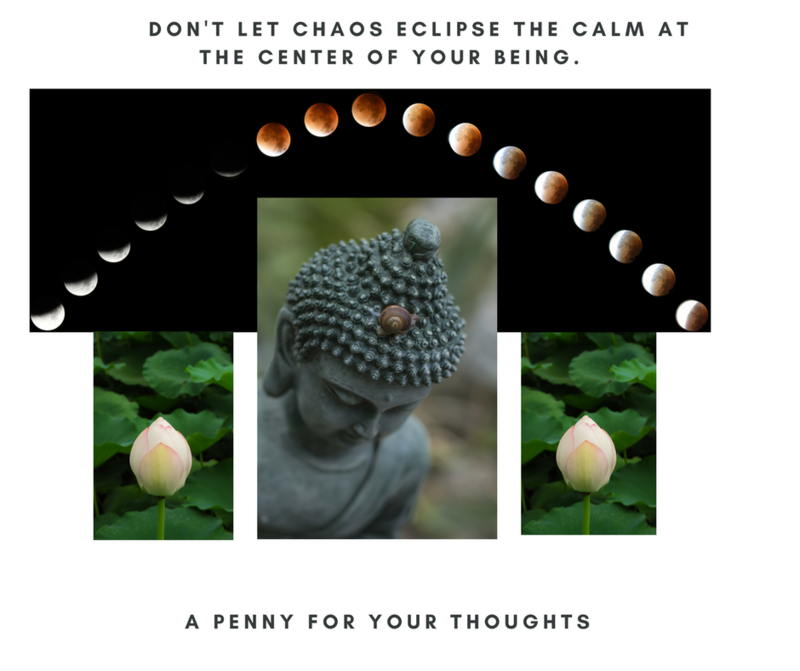 For example, I’m challenging myself to create A Penny for Your Thoughts post every day for 21 days. 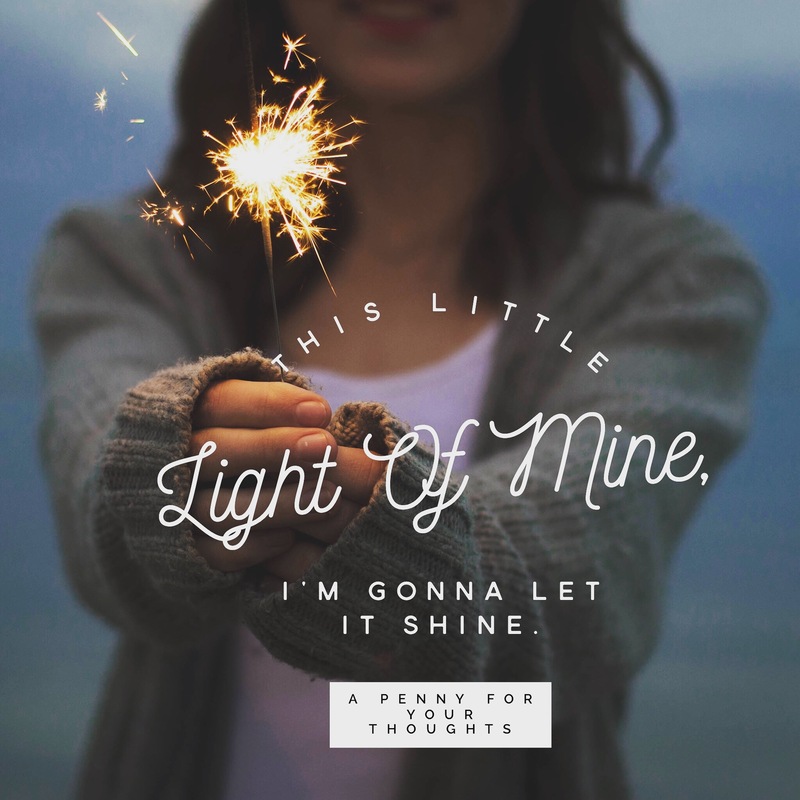 I’m going to pull a quote or idea from one of my over 300 blog posts and create an image in WordSwag or Canva and post it to Facebook, Instagram, or Pinterest. This is how I created the image above. I actually love to do this but tend to find a million reasons not to do it on a regular basis. It only takes about 5-10 minutes, it’s a great way to engage people in a conversation, and it allows me to unleash my creativity at least once a day. So if want you to join in on the fun and win stuff, too, just start doing fun stuff and let me know about it. The challenge starts now and runs through the end of August 2017. *One fun thing might be to register for the Tapping Into Your Wellpower Retreat and decide to make a long weekend out of it. You can stay at an area bed and breakfast and research some of the places you might want to go on Sunday. To find out more about the retreat, click on the Tapping Into Your Wellpower Retreat tab above. Today’s Sunday Summer Stretch Series topic – engagement – takes last week’s topic of Showing Up one step further. Because if you were at all impressed with what happened when you showed up and were present, you’ll be blown away by what happens when you show up and engage with others. How many of you who are reading this – or any number of blogs – have left a comment? If you haven’t, what stops you? You don’t want to take the time or go through the hassle of figuring out how to actually leave a comment? You’re reading it from a location that doesn’t lend itself to responding? You think you don’t have anything to share? You assume other people will respond so you don’t need to? You prefer to keep a low profile and keep your opinions private or anonymous? I certainly have used every one of the above reasons for not engaging with someone whose insights have totally shifted my way of thinking, saved the day, rocked my world, or even irritated the heck out of me. So I totally get it. I once read a blog post that challenged readers to engage by essentially calling us out as a cyber-stalkers. A bit harsh? Maybe. But I had to admit, I could be a bit more involved in the communities I was claiming to be a part of. I posted my first comment that day on that blog. Carolyn See’s book, Making A Literary Life, hints at something similar. She suggests we write a “charming note” to someone we admire in the industry five days a week , every week, for the rest of our lives. Now that’s a tall order, but I bet you can write a charming note, send a quick email, leave an encouraging comment, or, at least very least, “like” something once a week. Just this morning I responded enthusiastically to an email from someone who consistently sends out great content. It made me feel as good as it’s bound to make the recipient feel. This easily executable action not only helps another person feel appreciated. It allows me to be seen as a player, a contributor, an influencer or expert in my field. I really cannot afford to miss an opportunity like this to engage. Oh, not so. I’m a strange mix of an extroverted introvert. If I know my job is to be the Hostess with the Mostess, I will play the part with gusto. It does takes practice, however. And I’m going to need a long stretch of silence and solitude to recover from that enormous output of energy. Until you’re all in, until you do that thing that you think you cannot possibly do, you’re never going to succeed – even on your own terms. Because your success depends upon you showing up and engaging with others as only you can. You cannot hold back. You have to put your whole self in. Whether you shake it all about is your business. Until you apply these rules of engagement with other human beings, no one is going to see and respond to your light in the way you long to be seen, felt, or heard. I guarantee this will make you feel vulnerable. So we’ll talk about how to work with your vulnerability in next week’s Sunday Summer Stretch Series. In the meantime, let me know in the comments below (or send me an email at penny@wellpower.com if that feels safer) what you’d love to be – or already are – known for, seen as, or valued and respected for. For example, I’d love to be known as the go-to expert in transformational coaching. I’d love to be valued as someone who *gets* you and helps you unleash that certain something that makes you, you! Now it’s your turn. I can’t wait to hear from you! Also, head over to my YouTube Chanel, subscribe, and catch today’s video on Engagement.